The latest sculpture in Grant Park is "Urban Buddha," a 15-foot-tall effigy meant to send a message about global deforestation. The sculpture was installed Tuesday morning at the Grant Park Skate Park near Michigan Avenue and Roosevelt Road. Designed by Tibetan artist Tashi Norbu, the piece is comprised of about 3,500 pounds of reclaimed wood. Norbu said his artwork tries to send a message about the rampant deforestation in his homeland and throughout the world. 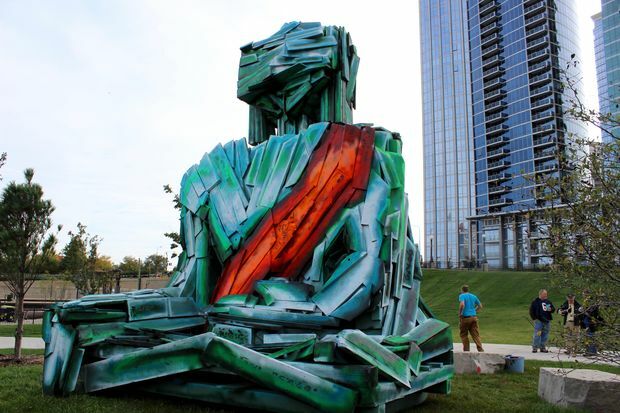 "Urban Buddha" is his first piece in the United States. We first heard about this in June. It appears to have been delayed slightly, but better late then never.